I loved Rabindranath Tagore’s Geetanjali as a teenager (and see no contradiction between his lovely poems, and Christian thought. He could just as easily have been a Judeo-Christian poet). Here’s a beautiful Tagore poem on the blessings of surrendering everything to God. I had gone a begging from door to door in the village path, when your golden chariot appeared in the distance like a gorgeous dream, and I wondered who was this King of all kings! My hopes rose high, and I thought my evil days were at an end. I stood waiting for alms to be given unasked and for wealth to be scattered on all sides in the dust. Ah, what a kingly jest was it to open your palm to a beggar to beg! I was confused and stood undecided, and then from my wallet I slowly took out the least little grain of corn and gave it to you. How great was my surprise when at the day’s end, I emptied my bag on the floor only to find a least little grain of gold among the poor heap! I bitterly wept and wished that I had the heart to give you my all! Ah, in my own life, surrendering things to Jesus has indeed been magic. Peace has come; worry has diminished; the burden of having to achieve is lightening. I have an amazingly productive friend, Paul, a writer, in full-time Christian ministry. For him, surrendering to Jesus was not without pain, but became addictive, a lightening of the load. He told me how, once he had done it, he would find himself at the bus-stop, thinking about areas of his life which he still “owned” and saying ‘Take that, too, Jesus. Take that.” I do something similar now, and find joy in it. For me, surrendering is a freedom from worry. In big things and little things. For instance, we bought a motor home from Sussex, 3.5 hours away. When we got it inspected, we paid someone to go and check it out, but gave in to laziness and did not join the mechanic. We were recently told that there is damp in the motor home, which has been there for a while. I am sad, and could worry, could freak out, but God provided the money to buy the camper van through blessing our work, so it seems ungrateful and foolish for us to be worrying about it. So I am just releasing it to him, and praying that it lasts 10 years as I want it to, and if not, that he provides us another one. Or another example: Zoe, our older daughter, is studying Theology at Oxford. And, now, ungrateful me, I am focusing on the best university for our bright younger daughter, Irene, 16, who has a year to go before University admissions. Nah, my heart cannot bear the weight of that intensity and worry. I need to release it to God, and know that his love for Irene will remain in full flood, wherever she goes to her first choice University, as is very likely. Or not. I went on a retreat to the Harnhill Centre for a Christian Healing, and received excellent prayer ministry. While there, I read Desert Harvest, the autobiography of the founder of the Harnhill Centre, an Anglican clergyman, Arthur Dodds. Arthur Dodds reached a turning point in his ministry after attending a John Wimber Signs and Wonders Conference. As did Peter Lawrence, the vicar-husband of a woman on staff. As did David Pytches of St. Andrew’s, Chorleywood, and John and Ele Mumford (leaders of the UK Vineyard, and parents of Mumford and Sons). John Wimber breathed the Spirit into England and Canada, through the Toronto Airport Fellowship (now Catch the Fire) and he didn’t even live in these countries. One of the striking aspects of Wimber’s life was his absolute surrender to God. I’m spare change in his pocket; he can spend me any way he wants, he’d say. His surrender was cemented by his period of manual labour, cleaning out oil drums, after surrendering his career as a highly successful and well-respected musician. When I consider how fruitful Wimber’s life was, how marked by miracles, it increases my desire to give Jesus everything. To surrender it to him, and to see his magic unfold. Heck, it’s his already, of course. As is everything I own. Like Job, our possessions, our family, our health, our mental health, our livelihood can all vanish. What surrender does is a voluntary placing in God’s hands of what is already his–like small children buying you a present with your own money. For me, it would mean putting my blog, my writing, my career, my health, my future, my finances, my home, my garden, my possessions,my friendships, my marriage, my husband, my children and their future into his hands, to take what He gives me, and give what he takes from me cheerfully. I have so often failed in this. Been angry at what was taken from me through my own errors, or other people’s uncaring or malicious actions. Sulky at what was given me, when I wanted an entirely different life. Absolute surrender would deal with the sulkiness when what we want is taken, or when we are not given what we want, or are given what we do not want. How do we get to absolute surrender? We can do it all at once as Wimber did, and Oswald Chambers did as detailed in David MacCasland’s Abandoned to God. Or we can do in increments, as my friend Paul appeared to have done. Step by step, handing him the things we fret about about, our worries and ambitions. “Bless our plans, oh Lord. Make them succeed. And if they do not, it will in no way diminish our love for you.” I hope I can say that. Yes, I believe I can. And in that surrender is blessing and fruitfulness. Isaac was Abraham’s son until he was surrendered to God. And then, in the act of surrender, Isaac became God’s son and the spiritual and actual ancestor of the Judeo-Christian peoples. 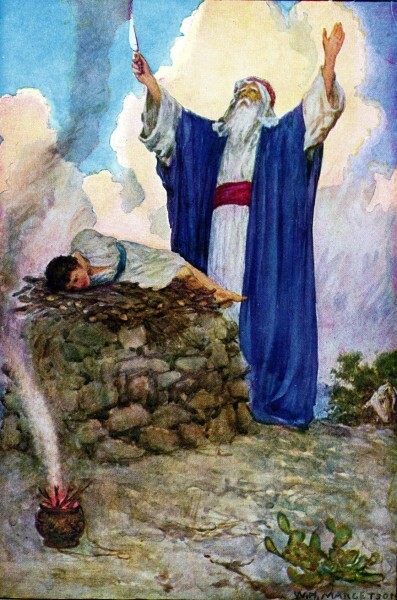 The surrender enlarged Abraham’s destiny, and Isaac’s. What a good bargain surrendering to God was! For Abraham. As it will be for you and me. Loose Change in God’s pocket; a puppet on a string, or? What’s your metaphor for your relationship with God? Surrender is hard when we feel we have too much to sacrifice. And in giving all away, it grows back 10 fold. beautiful, Anita. And so very necessary I know this place of the hard surrender and daily, this season in particular, God is showing me all of the various places I have tried to take back what I had given up to Him. May I learn to live as spare change in His pocket. I love that visual. Spend me Lord, any way you wish.